Few studies have examined the effect of a computerized order entry (CPOE) clinical pathway on clinical outcomes in hospitalizations for acute exacerbations of chronic obstructive pulmonary disease (AECOPD). Reducing readmission rates for AECOPD is critical to hospitals and accountable care organizations, as CMS is finalizing expansion of the Hospital Readmissions Reduction Program of the Affordable Care Act to include AECOPD hospitalizations in FY 2015. We instituted a CPOE clinical pathway for AECOPD hospitalizations in an effort to standardize inpatient management of inhaled and pharmacologic therapies, respiratory care interventions and ancillary services. 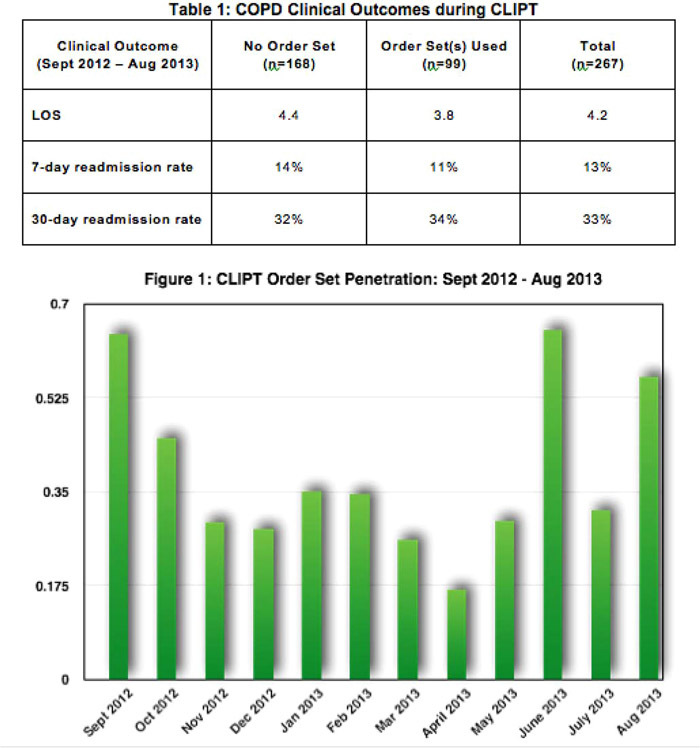 Our goal was to reduce the length‐of‐stay (LOS) and the 7‐ and 30‐day readmission rates. In September 2012, the COPD Inpatient Longitudinal Pathway and Transition (CLIPT) was instituted at a 552‐bed academic tertiary care medical center, after being created by a workgroup comprised of hospitalists, pulmonologists, respiratory therapists, pharmacists and information systems specialists. Based on national and international guidelines, CLIPT standardized inpatient management through CPOE order sets available for initiation in the ED, at or after admission, and at discharge. These order sets triggered respiratory care pathways, which optimized inhaled therapies, supplemental oxygen delivery and secretion clearance. Attending physicians and housestaff were educated about AECOPD and CLIPT through educational conferences, emailed reminders, and targeted real‐time pages. We analyzed clinical outcomes, including 7‐ and 30‐day readmission rates and LOS using a retrospective cohort design. AECOPD hospitalizations were identified by retrospective analysis of ICD‐9 billing codes assigned by attending physicians. Over the 11 month study period, 267 AECOPD hospitalizations were identified. One of the inpatient order sets was initiated in 37% (99) of AECOPD hospitalizations. Hospitalizations where one of the inpatient AECOPD order sets was initiated were found to have a lower LOS (3.8 days [95% CI, 3.20‐4.39 days] vs 4.4 days [95% CI, 3.66‐4.54 days). Use of inpatient AECOPD order sets was associated with lower 7‐day readmission rates (11% vs 14% [OR, 0.75; 95% CI, 0.35‐1.61; P=0.46], but higher 30‐day readmission rates (34% vs 32% [OR, 1.14; 95% CI, 0.67‐1.9; P=0.63]). None of the differences achieved statistical significance. Order set penetration waned after starting above 50%, but began to rise after initiation of targeted real‐time pages to housestaff and attendings. Chang W, Maynard G, Clay B, Liang N, Morris T. Impact of a Computerized Copd Inpatient and Transition Pathway on Clinical Outcomes. Abstract published at Hospital Medicine 2014, March 24-27, Las Vegas, Nev. Abstract 104. Journal of Hospital Medicine. 2014; 9 (suppl 2). https://www.shmabstracts.com/abstract/impact-of-a-computerized-copd-inpatient-and-transition-pathway-on-clinical-outcomes/. Accessed April 21, 2019.